This leisurely-paced walking tour carves a path through the streets of the charming Old Port. A hundred years ago this area was home to fish houses, canneries, industrial factories and textile mills. Unlike a century ago. when the air was heavy with industrial smoke, today the air is fragrant with the fresh ocean breeze and scents of coffee houses, bakeries and award-winning restaurants, all tempting passersby as they wind their way through the scenic narrow streets. 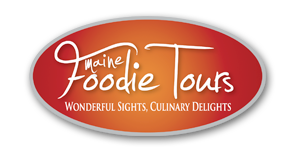 The friendly and engaging tour guides will take you to several old venues where you will have an opportunity to sample delectable, Maine-inspired foods and obtain a behind-the-scenes look at those who craft these culinary delights. Along the way, you will learn about the colorful local history unique to the “Port City”. As you sample the fare at various stops, the tour guides and proprietors will reveal the history behind their industry, the uniquely Maine products that are used and a little hint or two as to why they are simply award-winning year after year! Tours are offered weekends (Saturday at 10:30) in the off season and then daily June-October. The tour is 2-2.5 hours long and costs $45 per person. The price includes all food tastings and tour guides and the group is limited to 14 people. Tours take place rain or shine and meet at the Old Port Wine Shop located at 223 Commercial Street. Buy tickets at the Ticket Center or to purchase by phone, call 800-595-4849. Call center operators are available 24 hours/day—7 days/week. Culinary Walking Tour Information. Restaurant Week is more than a celebration of Maine’s incredible food scene, it gives restaurants a much-needed boost during a time when business often slows. Another important aspect of Maine Restaurant Week is helping local non-profit organizations. Thousands of dollars have been raised since Maine Restaurant Week’s 2009 introduction. Winter Maine Restaurant Week is set for March 1-10. 2012. Participating restaurants will be serv ing specially priced three course menus—priced at $20, $30 and $40. Also, some restaurants will be serving three course lunches for $15. The opening night signature event celebrates the statewide restaurant community. Maine’s top bartenders and desert makers converge and vie for the title of “People’s Favorite”. Attendees will be able to try each cocktail and desert entry and cast a vote to choose the crowd favorites. New this year, cocktails will also be judged by a panel of bartenders led by John Meyers, Maine bartender and cocktail scholar. Start Maine Restaurant Week in style and raise your glass to Maine’s amazing restaurant community. So far, 37 restaurants have signed up to participate in communities from Camden, Kennebunk, Portland, South Portland, Lewiston, Falmouth, Auburn, Kennebunkport, Wiscasset, Freeport, Topsham, Bangor, Cape Elizabeth, Eliot, Bath and Brunswick. A complete list will be available at the front desk for you during your stay during the Restaurant Week, and we currently have availability at the resort, so come on up and join in on this festive gourmet experience! Bet you never thought you’d put Mike’s Clam Shack and breakfast together in the same sentence! But once again, Mike has surprised us-and he is now serving breakfast. During the winter, it will be available on Friday, Saturday and Sunday starting at 7:00 am and running until 11:30. Mike’s is open for lunch and dinner year-round –closed on Tuesday during the winter. A visit to Mike’s facebook page has their breakfast menu posted, but it’s not yet on their website. If breakfast is as good as everything else at Mike’s, it’ll be great! He is offering egg specialities, omelets, the benedicts, pancakes, French toast and other specials to appeal to the hearty eater. Of course, your favorite Bloody Mary or Mimosa is readily available. You are currently browsing the Ogunquit Activity Blog blog archives for January, 2012.